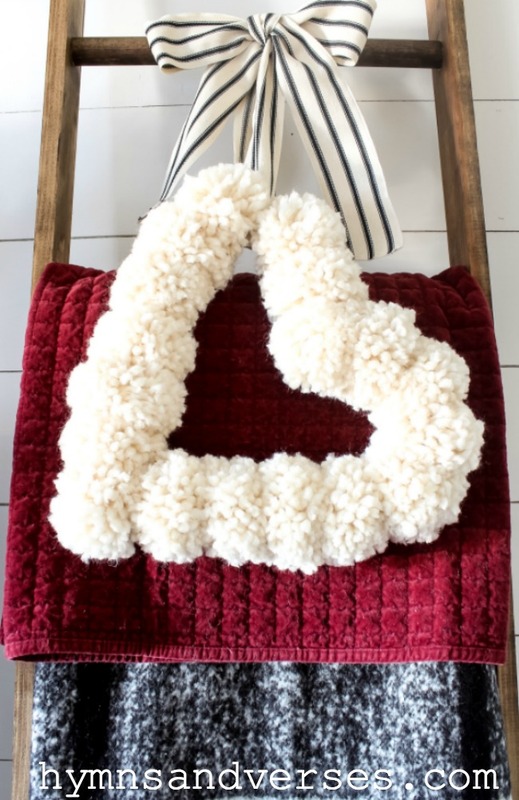 Today I want to show you how easy it is to make a DIY pom pom heart wreath! Valentine’s Day is less than a month away and the stores are packed with red and pink heart shaped everything! Personally, I like to keep my Valentine’s Day decor subtle. It’s not a holiday that I go “all out” on! But, I do like to add a few things to my winter decor just to cheer things up on these cold and blustery winter days! I made my wreath from a neutral, off white yarn and hung it from my blanket ladder in the living room. I attached the striped ribbon at an angle, but you could also hang it straight. I made this wreath in about an hour while I watched TV – it’s so easy! 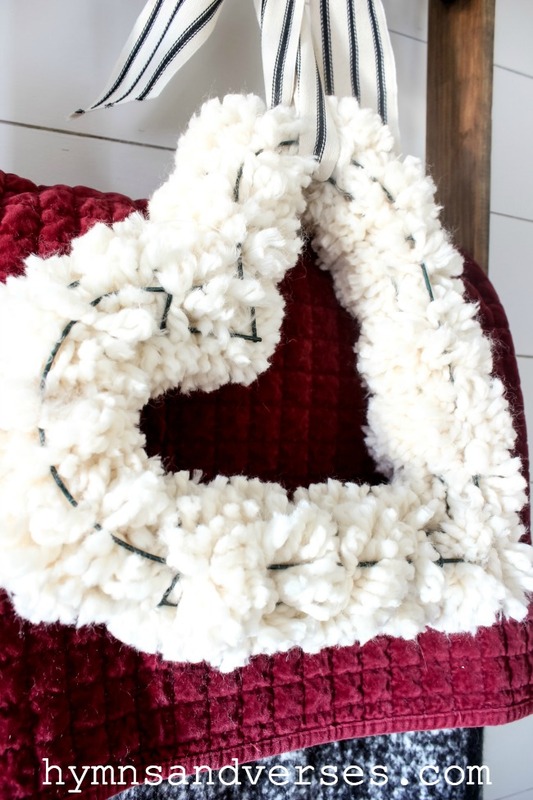 And, besides the yarn, you just need one thing – a heart shaped wire wreath frame that you can find HERE. The photo below shows the wire wreath frame with the pom poms tied to it. First, you need to make your pom poms for the wreath. You can see how I make a DIY pom pom in THIS post – How to Make a POM POM Garland. I also made a new pom pom garland for my mantel using this same yarn. For the garland and the wreath, I used two skeins of yarn. I do recommend a thicker yarn to get a nice and full pom pom. 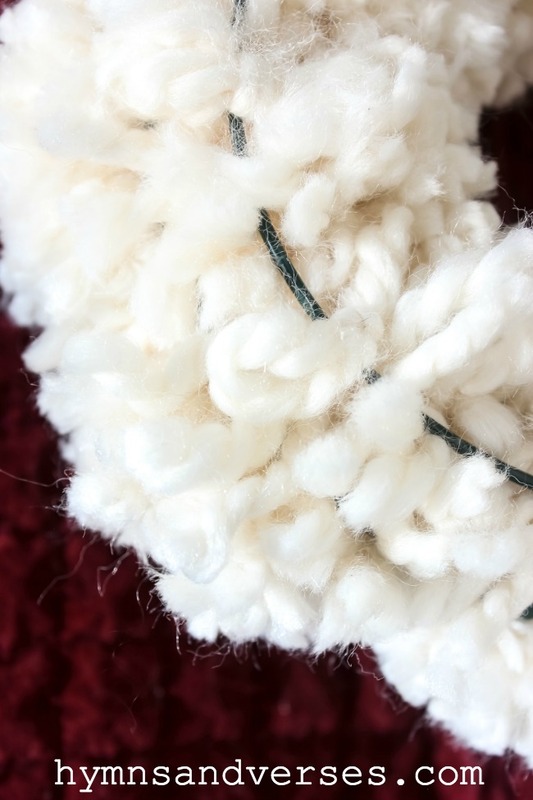 Once you’ve made all of your pom poms, tie them to the back of the wire frame using the longer pieces of yarn and trim as needed once attached. To do this, place each pom pom inside the front of the wreath frame and thread the ties out the back side of the wreath frame. Then tied the yarn around the center wire of the frame to attach it. Continue attaching the pom poms to the wreath frame until it’s full – I used 18 pom poms! You can keep this wreath to reuse next year, or if you want to change the color next year, just get some new yarn! I like to add some DIY pom poms to my decor in the wintertime, just because they speak “cozy” to me! Later this week, I’ll be sharing my winter living room with a few more examples of how pom poms can bring that cozy feeling to your home in the winter! Stay warm and cozy friends! Love this decor/craft! Will have to give it a try! LOVE this idea! So beautiful and so subtle! Thanks for sharing. I love the wreath! How creative and beautiful! Love this little craft! So cozy! Prayers for your neighbor/friend & her family in the loss of their loved one. So pretty and looks like an easy project! Gonna give it a try. Thanks for sharing all your ideas. Thank you for sharing this cozy craft and what is in your heart. Prayers to this family and all grieving the loss. You always have such wonderful ideas! This looks so good with the red wine colored throw behind the heart wreath. I may have to get a Pom Pom maker! I do like this bigger size and your type of yarn you used. We used to have several fun yarn shops in town but they’ve closed. I think your yarn choice makes the wreath!! I’ve never made pom poms with thick yarn before. It makes so much sense! Your wreath is lovely!